Last night on the porch I read “Monkeys Make the Problem More Difficult: A Collective Interview with Garry Winogrand”. It’s from a book that’s been out of print for twenty-five years. Which means it’s probably a month or so away from landing itself in Google’s library scanning project, so I thought I’d speed things along, as a follow-up to last week’s Winogrand video. I thought I might transcribe it to make it searchable (and accessible to all readers) but that’s just plain crazy. Click the picture to download and/or view the pdf. Q: But the thing that’s intriguing is not really knowing what the result is going to be like. 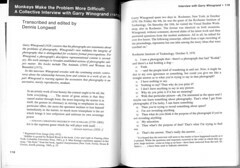 Credit: Dennis Longwell conducted the interview, and it’s in a two-volume book called The Camera Viewed: Writings on Twentieth-Century Photography, edited by Peninah R. Petruck. A few copies are available online – check your local library. thanks michael…always pick up something new from these intereviews. Was there anybody else in the world who thought about photography like Winogrand? Suis generis. Thanks for posting this. It’s stuff like this that makes me love this site. The most interesting thing about that quote is that it contradicts what Szarkowski says about his commercial work in Figments, which is that it was not very good: that Winogrand did the work in a workmanlike-way, but that his lack of interest translated into uninspired and technically unpolished work. We get it Garry, you like to talk about how things look in photographs. You’re a real formalist. But is it completely necessary to totally negate discussion of subject matter? The way you talk makes your work sound about as human as Mark Rothko’s or Ad Reinhardt’s. You gave a rap about gas stations.